Dozens of accident and emergency units are facing closure or being downgraded in a far-reaching overhaul of urgent care which senior doctors warn would have “disastrous” consequences for the NHS. An analysis of documents drawn up to remodel the health service in England shows that 24 casualty units from Durham to Somerset have been marked for potential closure despite record demand for A&Es and serious overcrowding across the country as the NHS goes through its most severe winter crisis since records began. Last month produced the worst performance for A&E waits in 13 years. Research based on 44 regional blueprints by the Johnston Press Investigation Unit reveals that managers are planning to cater for up to 30 per cent fewer A&E visits and plans have already been advanced to downgrade units to urgent care centres (UCC) with fewer specialist or consultant-grade staff. 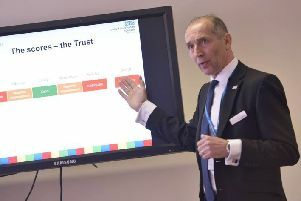 ** According to STPs in several areas, neighbouring units will go “head to head” to decide which should remain a full A&E and which will face closure or downgrade. See the full list of the 24 A&E units marked for closure. See the full list of the 19 hospitals facing closure. See the great nhs gamble what we have investigated and why.